New Zealand's voice of yachting and the America's Cup. Peter Montgomery is of that rare breed … a broadcaster who is better known than most of the sportsmen and women whose deeds he describes. 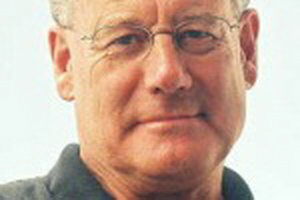 Peter Montgomery's abilities are not just restricted to commentating sailing – he is a successful sports broadcaster who hosts the No 1 rating show SPORTSWORLD every Sunday on Newstalk ZB and Radio Sport, and he has been a long time member of the Radio Rugby Team in Auckland as the sideline eye. Peter is also a trustee of the New Zealand International Yachting Trust as well as a member/vice patron of several other yachting related organisations. As New Zealand yachting has sailed the waves of unprecedented popularity in recent years it has been the distinctive voice and style of Peter Montgomery that has done more to increase the public perception of sailing in New Zealand than any other individual. He is stirred by the elements and by the intensity of competition. New Zealand Sailing and Peter Montgomery – One without the other, just does not sound right. As the voice of New Zealand yachting for over 3 decades, Peter Montgomery has covered all the major events including Nine America's Cups Seven Olympics Games and all Nine Whitbread/ Volvo races. Peter is recognised as an authority on the sport. His skill and commitment have been recognised across the world. He regularly commentates in other countries. Yachtsman of the Year – 1990, when the New Zealand Yachting Federation awarded their highest honour – The Bernard Ferguson Trophy. MBE in the Queens Birthday Honours 1995. The prestigious SPARC “Lifetime Contribution to Journalism through Sport” at The New Zealand Sports Journalists Association awards 2003. When Hollywood first went sailing in a feature length movie, it was Peter Montgomery who was invited to play the commentator in 'Wind'. Peter incorporated our theme beautifully. The audience was captivated. Peter gave a very enthusiastic presentation. He had a great response from the audience.